A chill has just gone through the collective spine of the bloggers of the Middle East. 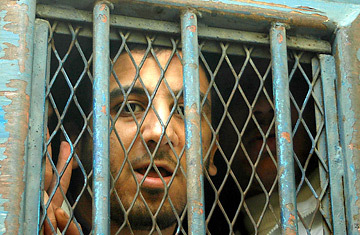 On Thursday, Egypt sentenced Abdel Kareem Suleiman (a.k.a. "Kareem Amer" online) to four years in prison  three years for blog posts that insulted Islam and one year for similar writings that defamed President Hosni Mubarak. While bloggers have been harrassed and a couple arrested by Mideast governments in the past, this is the first time one has been sentenced to prison. Before Kareem's arrest and conviction, internet writing was considered a safe and open venue for many young men and women in the region, a vehicle to freely express their opinions, doubts and misgivings about thorny issues in their tightly controlled societies. Kareem's blog posts would not have been that different. For example, he wrote about how he wanted to become a human rights lawyer working for the betterment of "Muslim and Arabic women." But his blog also condemned sacred Muslim rituals like fasting during the holy month of Ramadan. He mocked Islamic liturgies by saying "there is no God but the human being." He also posted his opinions on Coptic blogs  set up by the remnant of Egypt's pre-Islamic Christian community  which made him a target for accusations of heresy and apostasy. In November Kareem was detained, interrogated and held in an Alexandria jail without trial for two months before he was charged with spreading information disruptive of public order, incitement to hate Islam and defaming the president of the republic. The arrest had inspired rallies in support of Kareem around in Washington, Rome, Paris, London and Stockholm. On the site, Kareem introduces himself as a 22-year-old law student studying in Al Azhar University, one of the oldest colleges in the world, soliciting his readers help against all forms of discrimination. In truth, Kareem had been expelled from the university in 2006 after clashing with the school's conservative administration. Azhar officials considered his blog writings too critical of the school and its religious scholars. Kareem then had difficulty enrolling in another law school. Describing his distaste for his Al Azhar University experience he wrote last October about the religiously-run instution's "infiltration of public life and its control of people's behavior and its dictation of how to lead their everyday life..." In his blog, Kareem predicted that he would get into trouble with the law for his views. Still, he insisted on his right to freedom of expression and made no secret of his disgust for the laws that govern the system and restrict his liberties. He warned Al Azhar scholars and professors that they would end up in "the garbage of history." The sentence surprised Gamal Eid, the Executive Director of the Arabic Network for Human Rights Information. The most blog-repressive regimes had been Tunisia, followed by Saudi Arabia, Syria and Libya, which have blocked sites and limited internet access. Eid had written earlier in the year that "the Egyptian bloggers, in particular, are pioneers who have guided other Arab bloggers" and that, despite limited numbers, the influence and popularity of Arab bloggers "have exceeded all expectations. The blogs act as a pain in the tooth for many Arab governments which fear citizens gaining the means to reveal their illegal and anti-democratic practices." Dismayed by Egypt's conviction of Kareem, Eid told TIME, "It is a gloomy day for all the advocates of freedom of expression not only in Egypt but also in the whole world."